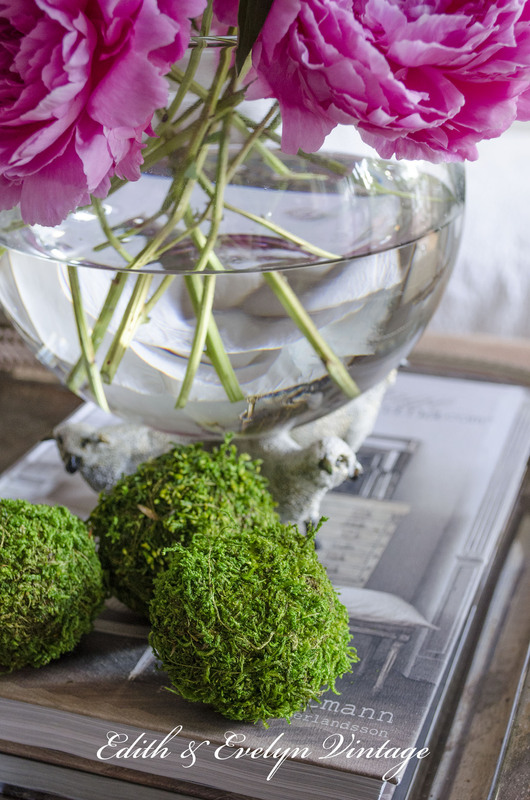 I have collected moss balls in different sizes for a long time, and love using them in decorating. It’s a great way to bring some green inside the home without having to keep a plant alive. And since my green thumb is more brown than green, it works perfectly for me. 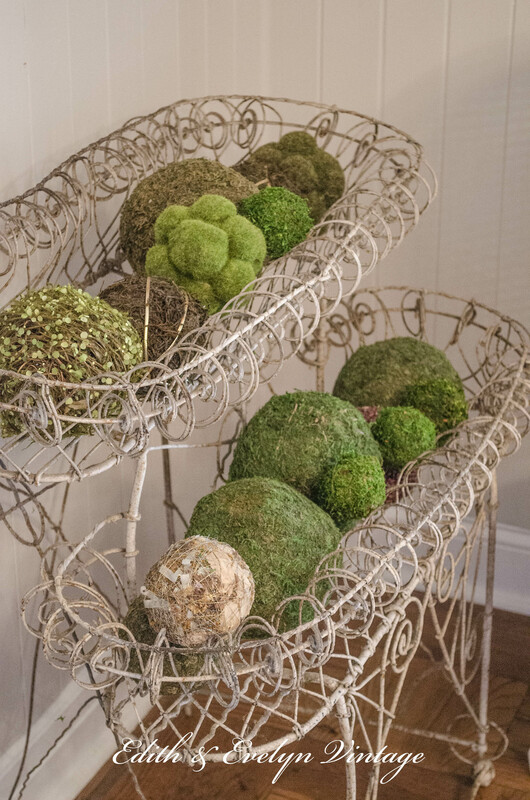 I have the moss balls in different sizes and use them to fill up the old dough bowl and also an antique wire planter in the dining room. 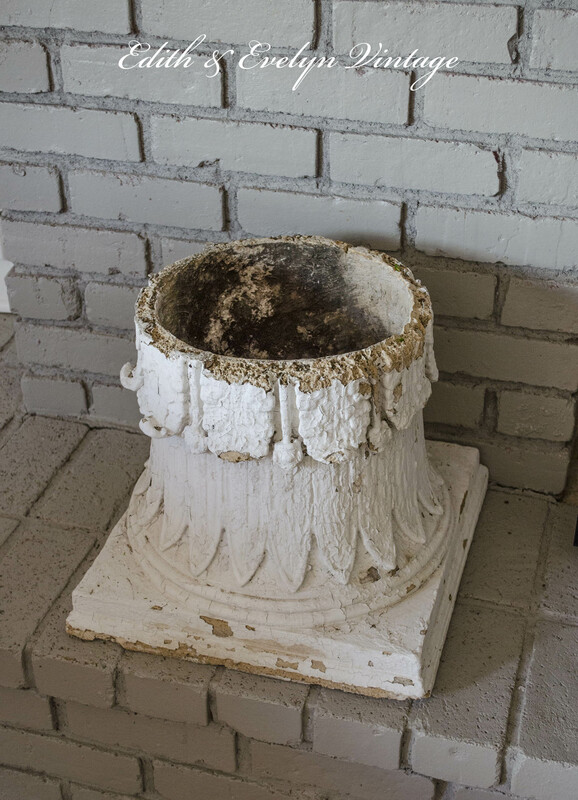 I recently pulled out a pair of amazing old architectural capitals that I picked up at an estate sale in Alabama several years ago. I wanted to flank the fireplace with them and sit a moss ball on top of each one. It was going to take a 12″ diameter ball to fill the opening. 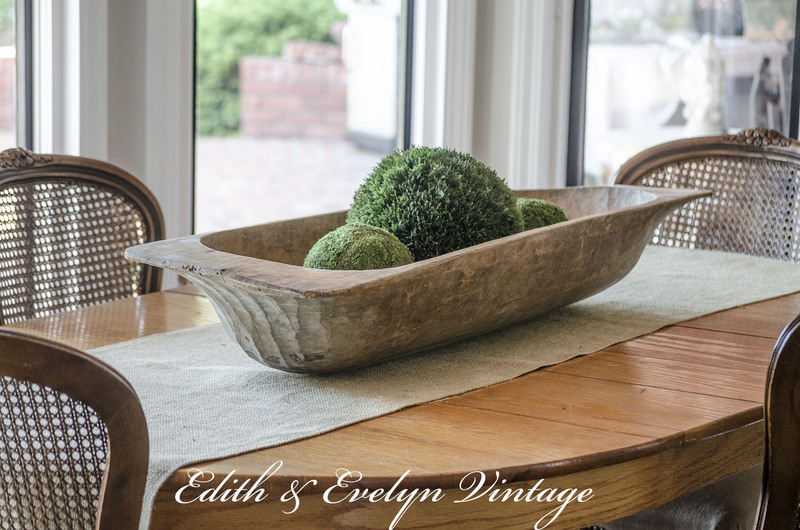 Originally, I thought that I wanted preserved boxwood balls, but after seeing the prices (over $100 ea! 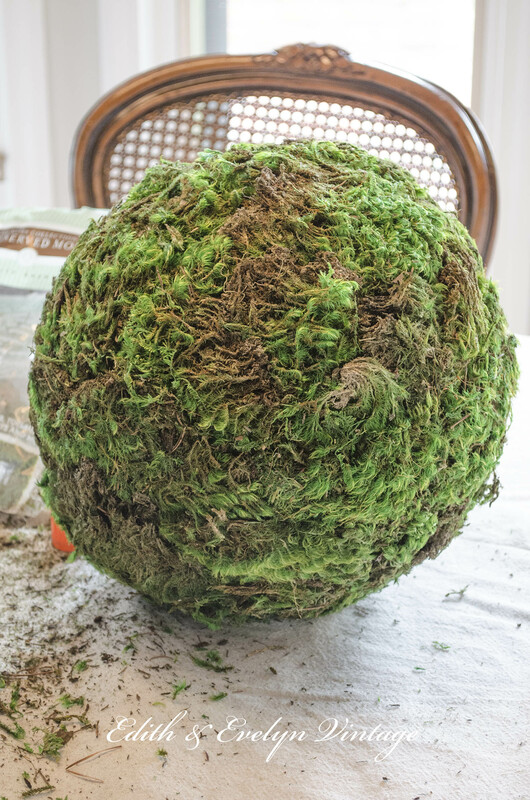 ), decided that I would just try making a large moss ball to fit in each one. I finally found a craft store that sold 12″ styrofoam balls…..at $35.00 each. Ouch. I found that to be ridiculous. So off I went to the dollar store and picked up a pair of 12″ plastic balls. They were the perfect size and once covered in the moss, no one would know what they were originally! 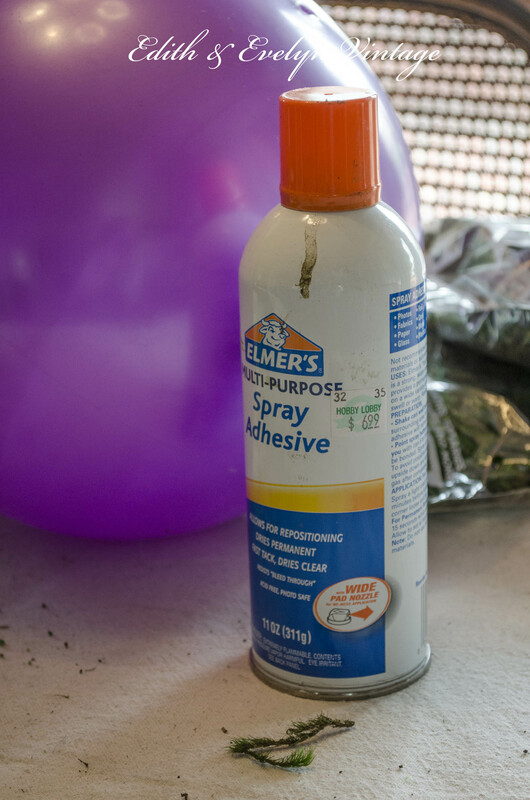 I bought bags of preserved moss (it took 4 bags to cover one 12″ ball) at the craft store as well as a can of spray glue. The moss will be in clumps in the bag, so before I started gluing, I broke off small pieces of moss and worked it with my fingers, gently mashing it down into a flatter piece. Then working with one small section at a time, I sprayed the small area with glue, and pressed the small piece of flattened moss onto the ball, working my way around the entire piece. This was so easy to do and took no time at all. And they look absolutely perfect sitting on those capitals. I don’t know why I have been trying to find moss balls all these years, I could have been making them all along! I’ve got a can of old tennis balls somewhere, and they will be perfect to do this with, for a different size, to add in with my others. You could use any kind of round ball, the possibilties are endless! Hubby may have to hide his golf balls……. 07/09/17 Update: Over a period of time, the moss will loosen in some areas from the ball. To alleviate this issue, I’ve taken thread in a green color and wrapped it around the ball several times, going in different directions and then tying it off. 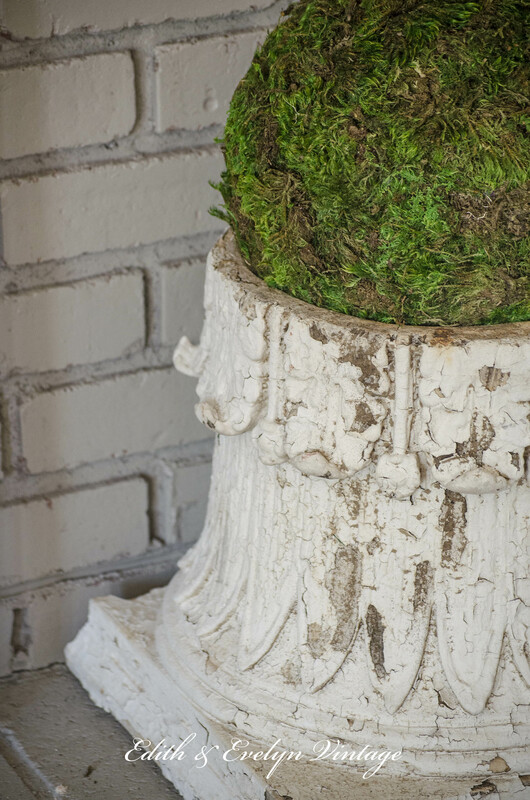 This helps keep the moss secure over the years, and the thread blends with the moss in a way that you don’t even see it! Just a quick update on the master bedroom renovation. We have finished spackling and priming over the wallpaper and now we are starting the painting. 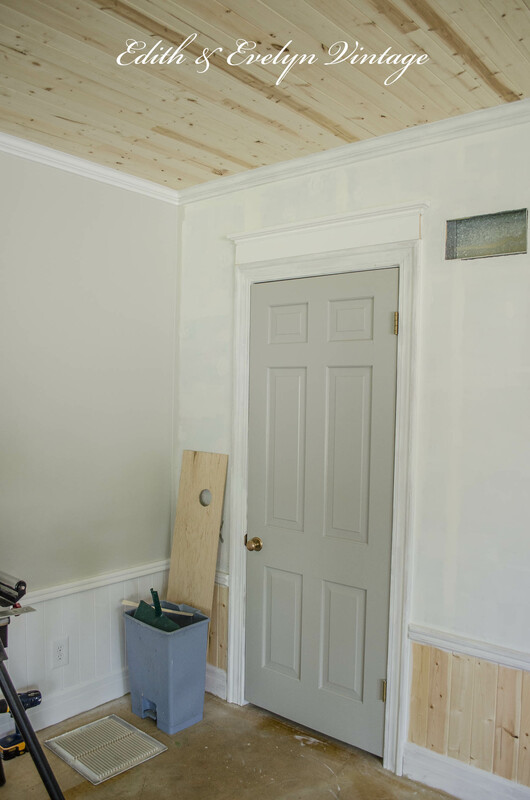 We have a couple of the walls painted with the gray (SW Agreeable Gray), all of the doors have been painted (SW Pussywillow), and we have added extra moulding and trim at the top of the doors to give some added height. We are still working on painting the woodwork and trim, as well as the planking below the chair rail (SW Snowbound). 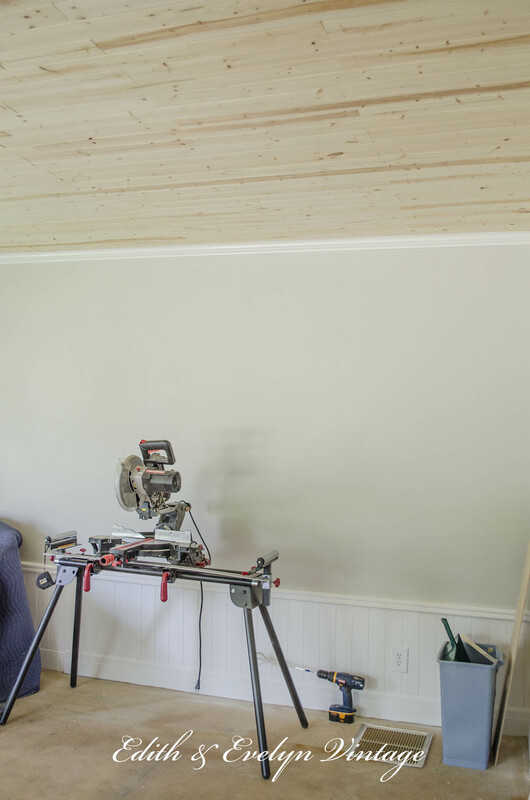 We planked one wall around the window seat. It will be the back of the built in cabinets and bookshelves. Flooring will be ordered this week and hopefully all of the painting will be finished this week as well. I still have to finish the ceiling, and I think I’m going to go with pickling. It will definitely need to be done before the floor goes down. And I’m still looking for a chandelier. Cindy! LOVE LOVE LOVE your home! This style has been my dream forever!! Thank you so much for sharing, you both are truly gifted! Its better than anything I’ve seen …. including magazine’s! Really!! I Love the idea of the moss balls!! I, too, found them ridiculously priced high. Can’t wait to see your master bedroom! Take good care and thank you once again. 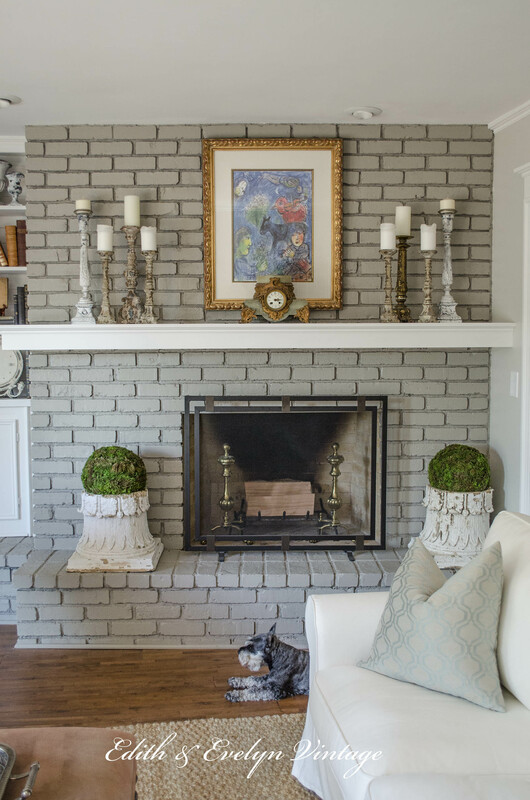 I have a friend coming to visit and we are tackling our fireplace, perfect color you have! Thank you so much Leanna! That means so much to me. Good luck with your fireplace! It’s an easy update for a major impact! 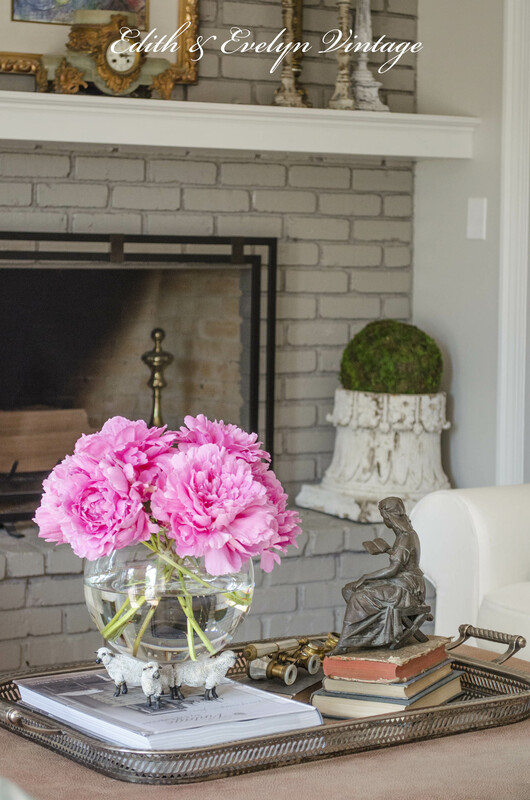 Hi Cindy …I thoroughly enjoy your blog and decorating. 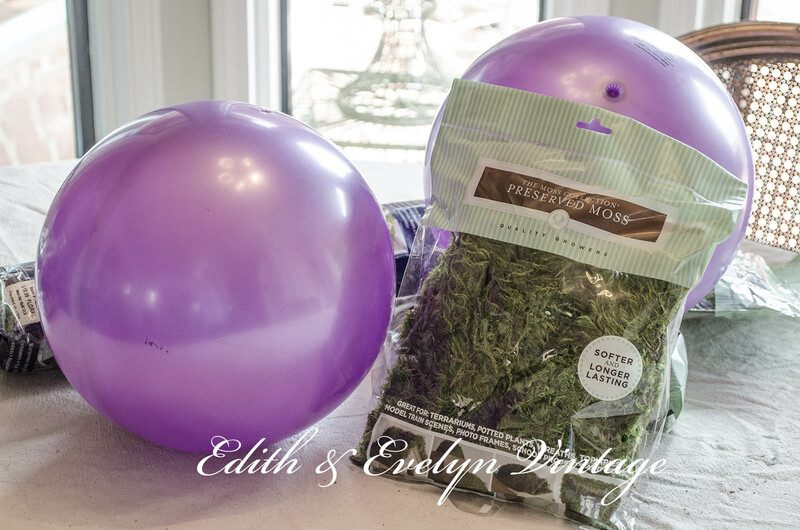 My silly question is … Does the balloon not deflate or wither in size? I will be trying this out. Thanks for sharing! Thank you Robin! The balls are a plastic material, thicker than a balloon. And though there is the possibility that they can deflate over time, so far mine are still fully inflated! The only thing I would change is the type of spray glue that I used. I would recommend using the 3M spray glue, it’s much stronger than what I used, and I’ve had to reglue a couple of spots. You have a beautiful home! 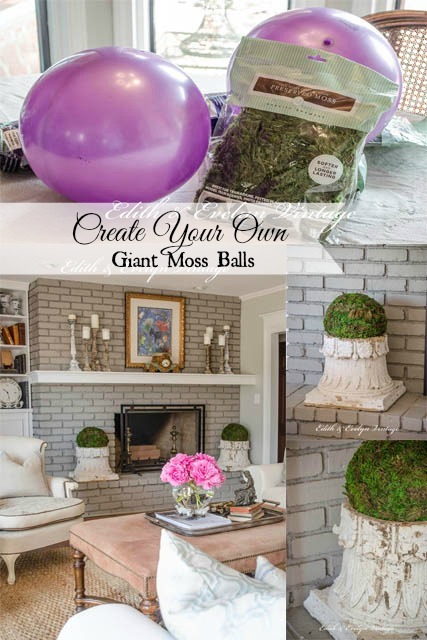 What a genius idea for making moss balls! That is sheer genius, Cindy and they look awesome! Genius and thrifty! That is a wonderful combination!! You amazed me again. I have just added your blog to my list and a favortie!! Thank you Sheryl!! Thank you so much for following along! Love your moss balls! Don’t understand why boxwood has to be so darn expensive! I have been looking for a boxwood wreath but every time I find one, the cost is so prohibitive. I’ll continue my search. Maybe someday I’ll find one at a thrift store priced/donated by someone who doesn’t know any better. Your house is so pretty. I love it when I get your blogs. Thank you Rhonda! 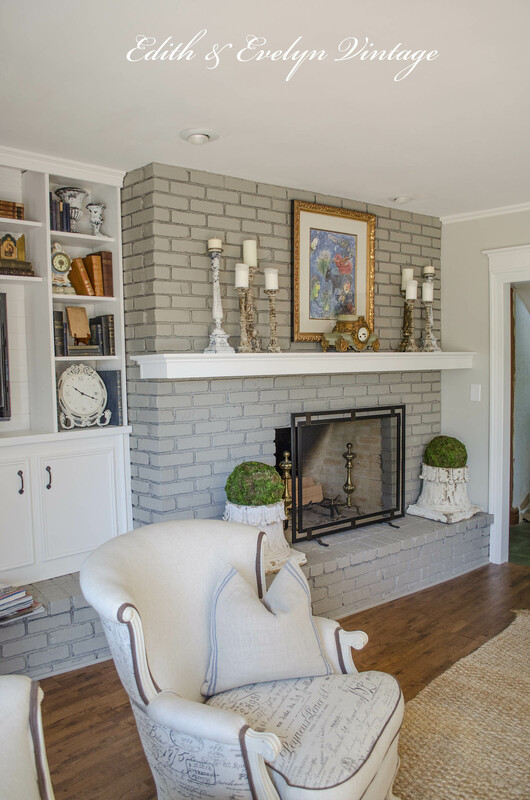 Yes, SW Snowbound is the white we have used throughout the renovations! I tried Eider White, and like you, I found it to be a little bit too gray. But I love Snowbound! Loved the lamps on a previous post about painting a French dresser. Could you tell me where you found them. Thanks. Hi Judi! The lamps came out of an estate sale. What a great idea to use a dollar store ball!…I will need to make a trip to the dollar store soon and hope there is no run on these!! 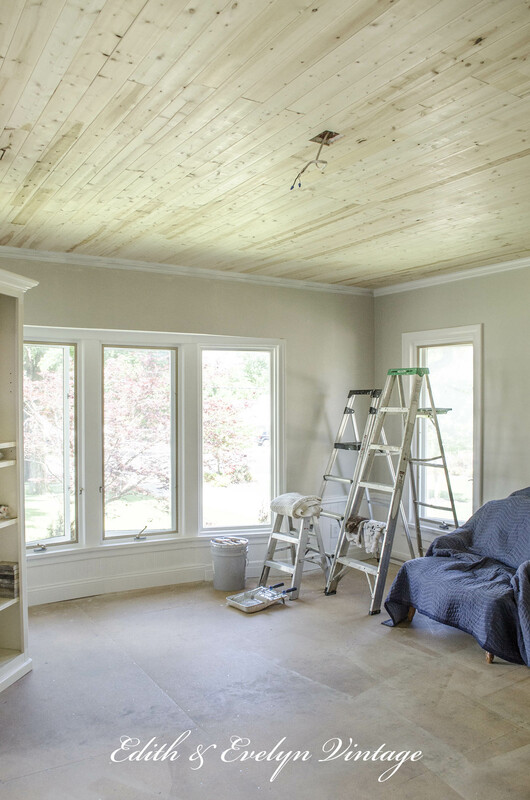 !…Beautiful job!….and loving the updates of the bedroom…It is certainly coming along so beautifully! 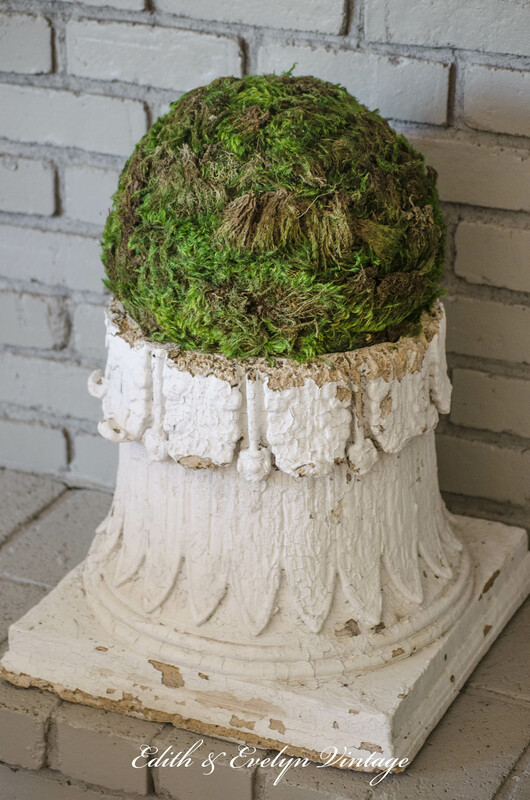 Thank you for your great idea for turning dollar store balls into moss balls! Very creative. I’m also enjoying your bedroom updates. Your space is going to be gorgeous! 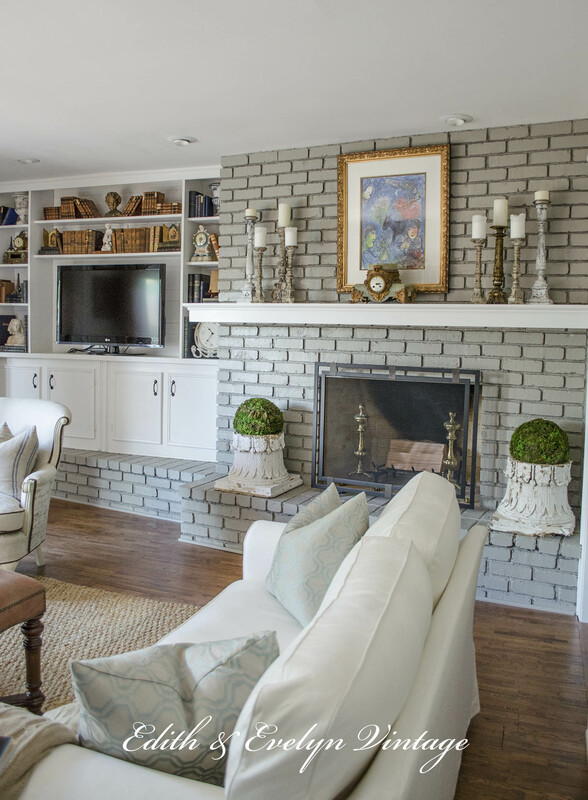 I love what you and your husband have done with the ground floor of your home. Beautiful! 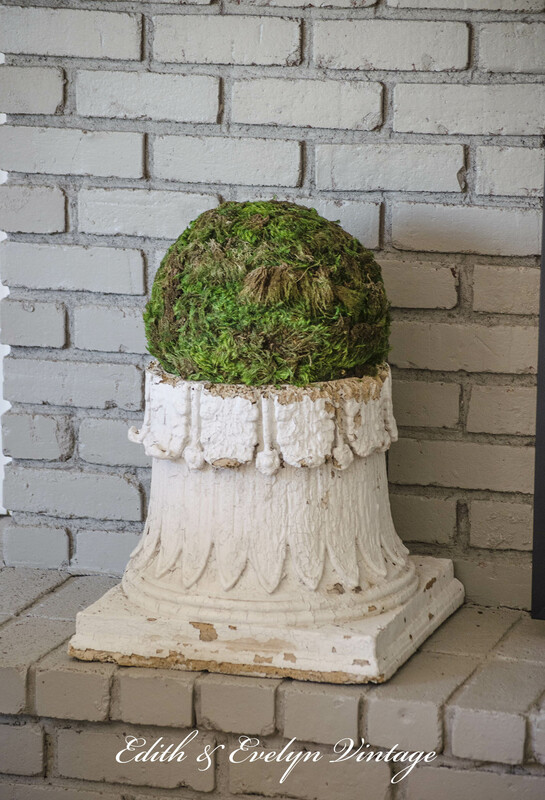 You are so clever covering those dollar store balls with moss…they look great!! Your are so clever! I love your moss covered balls!! Great progress in your bedroom. I am enjoying following the renovation! Thank you Sandy! Yes, I guess it could be called a ranch and half, though there is only one bed and bath upstairs. An architect friend has told me that the correct style is Country French Ranch. Thank you so much for following along! Your welcome! You have so much beauty to share. Yes, a Country French ranch sounds like a good description. 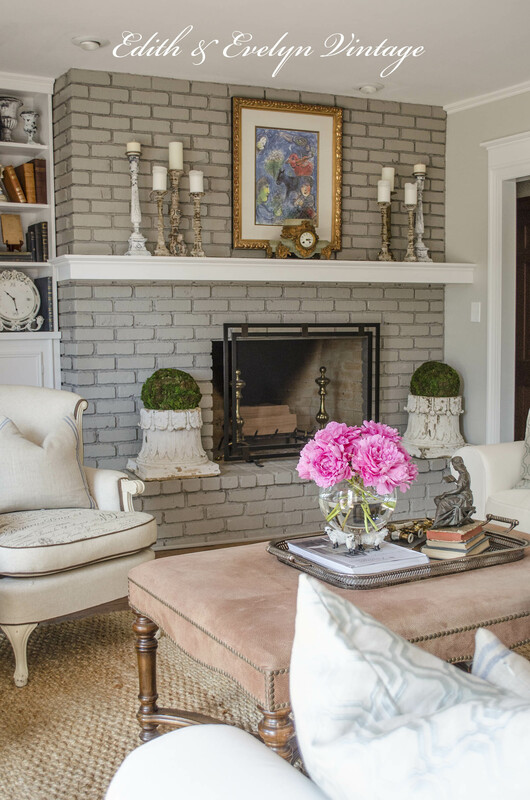 Your whole house redo is fantastic! It had excellent bones to begin with. Rhonda, I love this story! Love the moss balls. I have been collecting them to fill a dough bowl. Saw one in a store and they wanted $400.00 for it. How did you make the smaller ones like it shows in the iron planters. The ones that look like they are a bunch of little hills all over? Love everything you have shown. Thank you Janet! 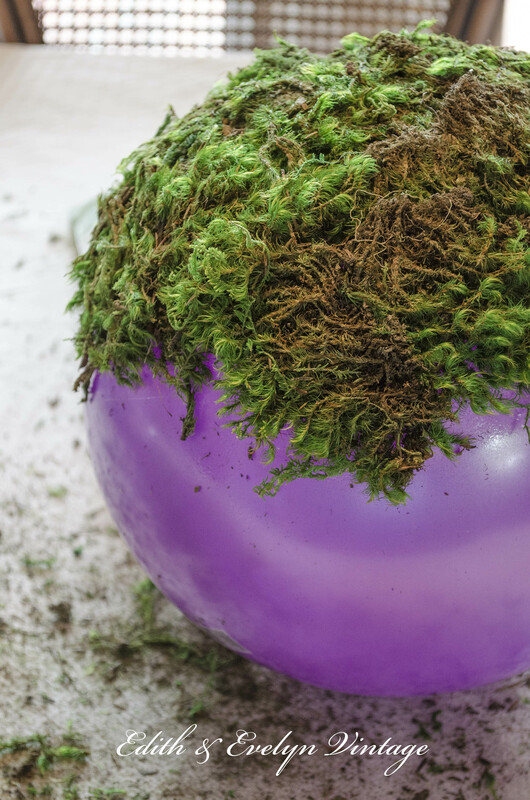 I actually purchased those moss balls with the “lumps” in them several years ago. They are about the size of a softball. You could probably make something similar, maybe just adding more moss in areas to make it “lumpier”. 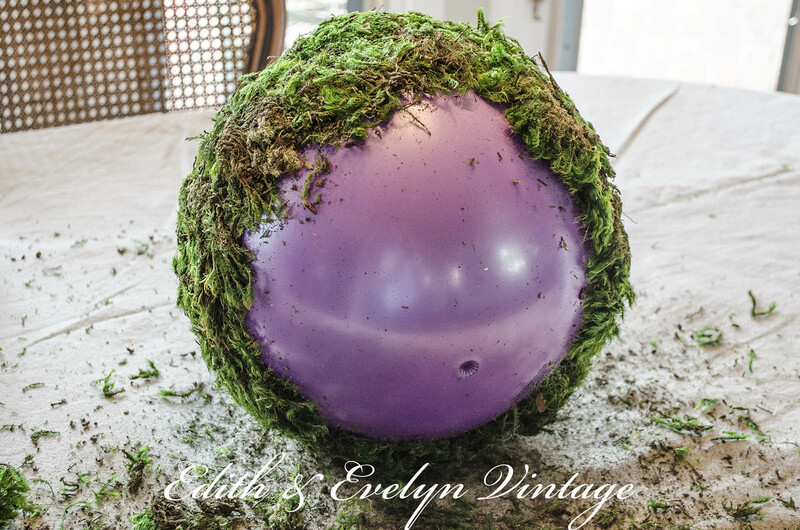 Love your awesome moss ball idea!!! Beautiful. I too love to hear from you. There is always something wonderful to discover. I do love moss balls. They add so much nature to a space. Love the progress on the bedroom. Can hardly wait to see what’s next. Blessings! Oh my-how creative are you?????!!!!! What a smart idea. I think I’ll use your idea & make a giant miss ball. Your master bedroom space is gorgeous. Thanks for sharing everything. Love, love, LOVE! You are a creative lady! Oh…I love your big moss balls! I have wanted to do the same but didn’t because of the cost of the styrofoam. 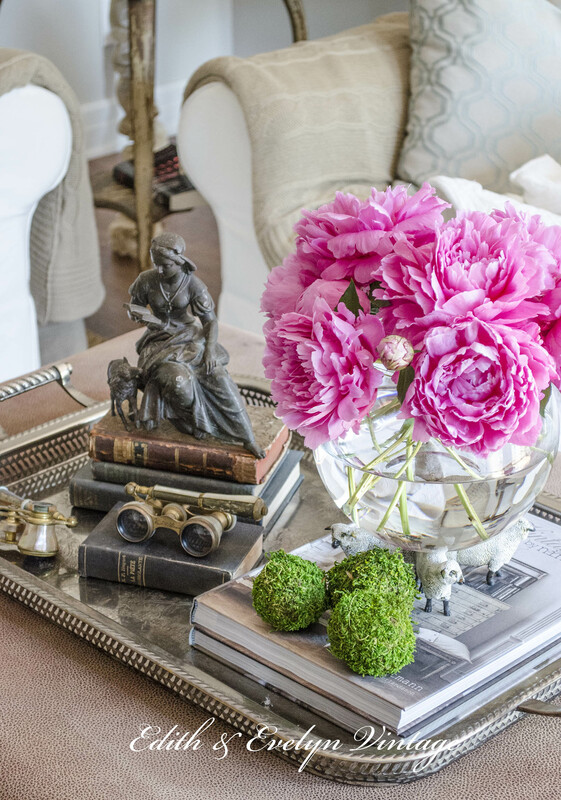 Yes, use balls from the dollar store…great idea and I love the way you displayed them! This post was one of those a-ha moments for me. 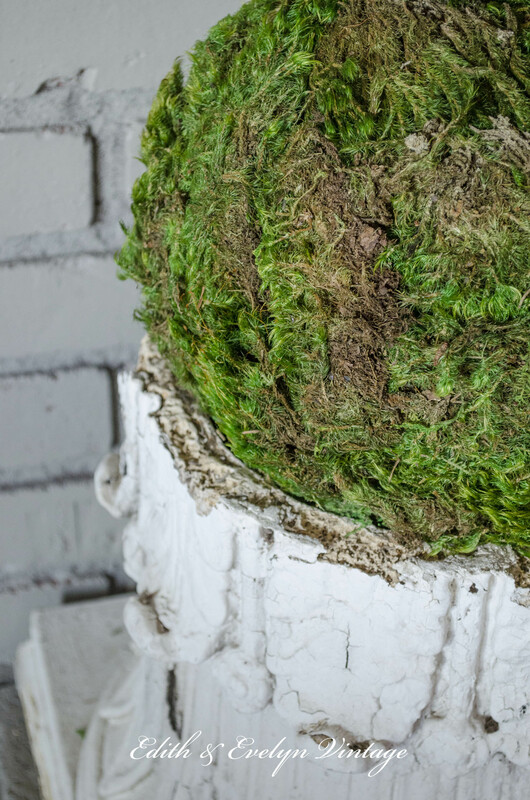 Pure Genius.Thanks so much for sharing your moss ball hack and your space is gorgeous. I’m passing along. Love your idea…. 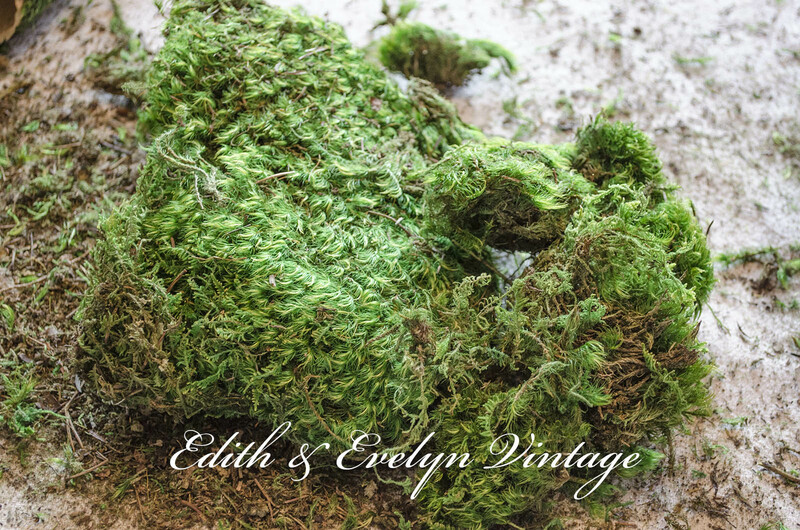 I am doing a display garden table in June for a function and using moss as my theme… This will help save me a bit of money!!! 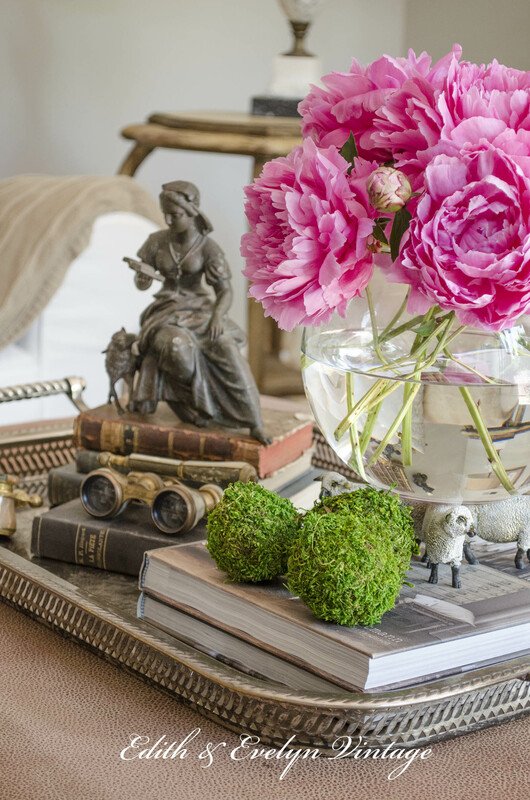 Your bedroom is coming along beautifully…..
Those large moss balls look fabulous on either side of the fireplace. Great idea! 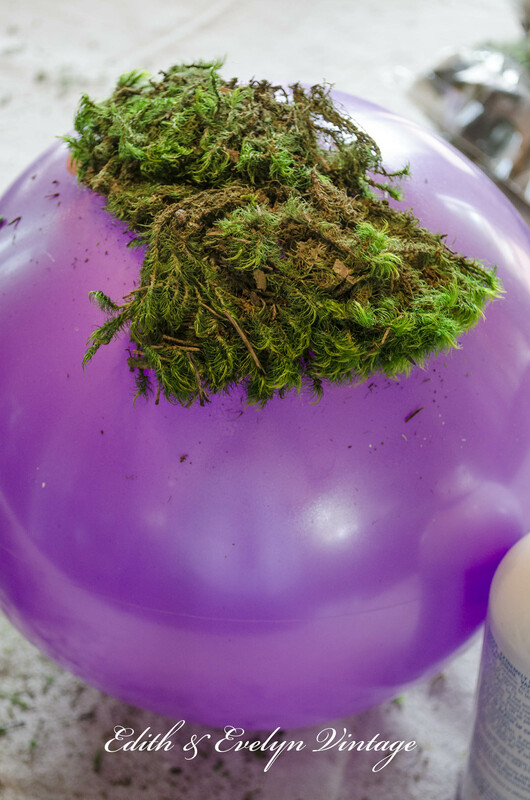 Hmmm… I am so going to the dollar store and making some moss balls. Put some back last week before of the price. Now I can make my own!! Thanks Cindy. Amazing transformation on the Master bedroom. I have glued that moss to a small styrofoam ball. You are so smart using a cheap ball. Love the finished look! Can’t wait for your bedroom reveal. I know it will be fabulous.